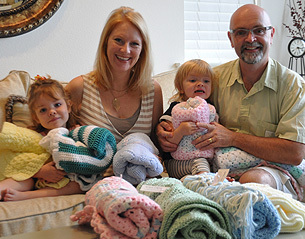 Sadie's Angels blankets bring comfort to children and their families. A special thank you to our newest group of Angels- the United Church Women in Humber, Newfoundland for all of their hard work in making 18 beautiful blankets just in time for Christmas and for Jan Parrone and her group of knitters at Our Lady of the Assumption Church in Ventura California for their ongoing commitment to Sadie's Angels- combined these two groups have just sent in 24 blankets in time for Christmas! Thank you and God Bless you from all of us at Sadie's Angels. 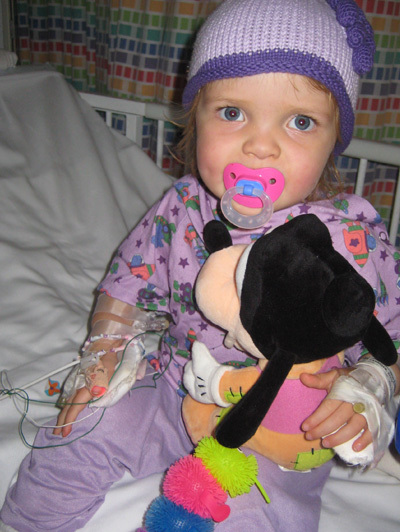 Thank you all for your prayers and support for Sadie last May during her final heart surgery (Fontan). It was a success, and Sadie is now a very healthy, happy 3 year old. Kids come from all over the world for life saving surgeries to Children’s Hospital Los Angeles. Our daughter, Sadie was one of those children. 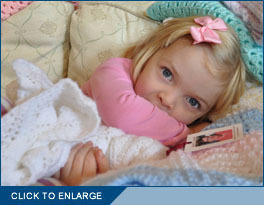 She is now a happy and healthy three year old, but many children are just beginning their journey with CHLA. Our goal is to donate 600 blankets a year, to comfort children and their families while they spend time in this very special hospital. Angels are everywhere and if you open your eyes you can see them. They can be seen in the little babies whose light continues to shine despite severe medical challenges; in the nurses who may be exhausted yet continue to care for our children as though they were their own; in the doctors who spend countless hours away from their own families, in order to help the children at the hospitals; in the surgeons who believe that there might be a chance to save a child's life and who work against all odds to save that life; in the paramedics, firemen, policemen and emergency rescue teams who never lose their focus on helping others; in the families who believe in their kids despite being told that they may not make it and in all the volunteers who spend countless hours working at the hospitals, churches, schools and community centers to name just a few places. This site is dedicated to all those children and families who have battled or will battle through the challenges that Congenital Heart Defects pose. It is dedicated to all of the angels out there who give of themselves to help others. 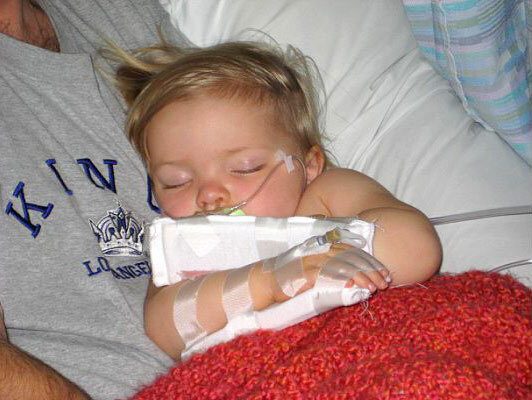 A child is born every 15 minutes with a congenital heart defect. Congenital heart defects are the most common birth defect in North America, affecting approximately one in one hundred, or 32,000 newborns each year. Our daughter, Sadie, is one of these children. 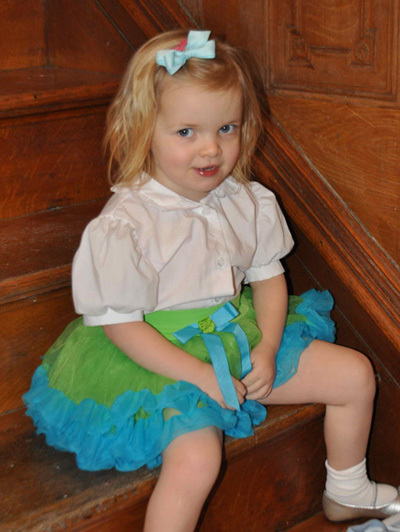 Sadie was born with several major congenital heart defects and courageously and tirelessly battled through 3 operations before she was even a year old. Through God's grace and the work of the people whom He blessed with the ability to heal, Sadie is now 3 years old and thriving. Her future looks extremely bright. Our hope is that this site will educate, help and give comfort. Most of all, we hope this site will inspire you to become one of Sadie's Angels and make a difference in the life of a child in a hospital.